Monserrate was found guilty of the lesser charge of third-degree assault for dragging a bleeding Giraldo down the hallway of their building after the alleged attack. That charge is only a misdemeanor so the lawmaker will be able to keep his seat in Albany. Despite initially claiming Monserrate attacked her, Giraldo had refused to cooperate with the prosecution in the case. Oh, and there was video! Classy again! So who are the generically branded “Coalition for Morality”? We don’t quite know. My Googling has come up dry, and the others who have reported this have had similar results. For all we know, Monserrate could have printed them up himself! So there you have it. 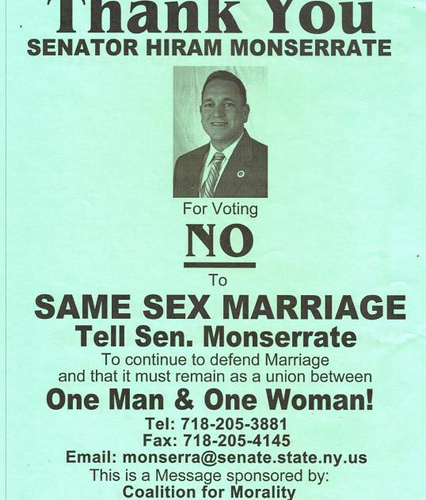 According to some people, Hiram Monserrate, abuser of women, can claim moral authority over gay people who choose to live our lives with integrity.